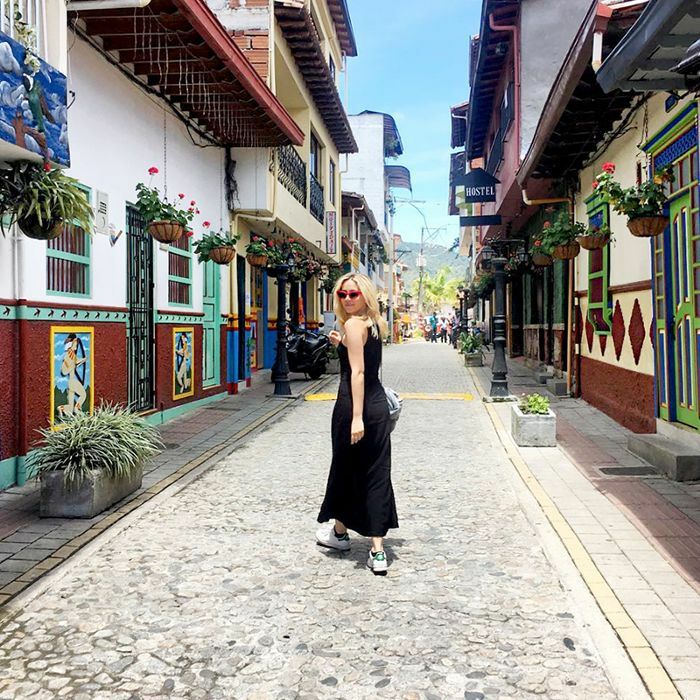 When it comes to venturing to a vibrant Spanish-speaking place, it’s fair to assume Colombia doesn’t come to mind (the truth is that despite what you may have heard in the past, most parts of the country are safe, as long as you exercise common sense). You see, the things to do in Colombia are numerous: It’s rich in history, it has delicious food, and it’s home to friendly people. Add in its blue skies and breathtaking beaches, and you’ll never want to leave. In fact, there is so much to do in this part of the Caribbean that it can get a bit overwhelming when it comes to planning an excursion. That’s why we decided to put together a no-fail itinerary for your 72-hour stay. Ditch your guidebook: These are all the things you need to do on a three-day trip to Colombia (you won’t regret it). No matter where you are, you likely start your day with a cup of coffee. Thankfully, you’re in Colombia, which boasts some of the richest beans in the world. Venture over to the old walled city’s center to Abaco Libros y Café in Cartagena for your morning brew—it’s like exploring a modern-day Beauty and the Beast library with a coffee shop inside. You can browse and purchase rare volumes (it’s stocked from floor to ceiling), plus the Americano over ice is beyond refreshing. It’s not a true trip to Cartagena without exploring the walled city on foot (preferably not in a tour group, as you’ll be able to go off the beaten path). The “Old Town” is made up of two areas—El Centro and San Diego, and you’re sure to see brightly painted churches, monasteries, mansions, and more. The town itself is surrounded by Las Murallas, which are walls that served as barriers to block invasions from enemies post 16th century, and most of the architecture is still intact today. Take a short walk over to La Cevicheria for a late lunch. It serves some of the tastiest ceviche in the city. We like that it has outdoor seating right in the town square that offers you the opportunity to catch up on your people-watching while having a bite. (Try the squid ink rice, too). Head to La Vitrola, the place to see and be seen in Old Town for dinner (make a reservation for no earlier than 8 p.m.). You can eat as much as you’d like because you’ll burn it off dancing at Cafe Havana while listening to live music. One of the best parts is that it’s not just a tourist trap; tons of locals come to salsa around 10 p.m. onward. When you’ve decided to catch some z’s, return to Hotel Casa San Agustin with its stunning accommodations right in the middle of the walled city. Now it’s all about some R&R. Take the bus to Mercado Bazurto, and begin haggling for a speedboat trip to Playa Blanca in Isla Barú—the white sand beach of your dreams. Once you’ve got your spot saved, it will only be about a 45-minute journey. Lay out, and enjoy the great sunshine, preferably while sipping a Coco Loco cocktail out of a fresh coconut shell. Food vendors offer everything from oysters to lobster, so come hungry (helpful hint: Set the price of what you’re buying first). Head back to the dock before 3 p.m.—otherwise, you may be stuck in Playa Blanca until morning. Side note: It can get wavier on the way back, so protect your tech gear, and don’t wear anything you don’t want to get soaked. You’ll be tired from a long day of adventuring, but when in Cartagena… cozy up on the outdoor patio at Cafe del Mar at the edge of the city overlooking the Caribbean sea. These spectacular sunset views are not to be missed—settle in with a bottle of wine, and relax. Although you’ve had fun in Cartagena, it’s time to head to the shores of the Bay of Santa Marta (it’s one of the oldest cities in South America). Venture to the Cartagena Bus Terminal, and look for the Brasilia or Berlinas bus companies. The one-way ticket cost should run you around $15. The trip itself will take you around four hours, so bring a book, some music, or chat with a friend (old or new). Check into Casa de Leda (or at least drop your bags off). This Instagram-worthy boutique hotel is a mere two blocks from the main town square and also has a pool, a jacuzzi, a spa, and a restaurant on-site. For lunch, walk to Lulo for a margarita and local arepas (the Lula Sombrerona is the best). To immerse yourself in local history, tour Museo del Oro, which houses ancient artifacts like pottery and gold from its indigenous people. If you’re not looking out for it, it’s quite possible you could miss Tierra Negra, one of the absolute best places to get dinner in Santa Marta. It’s nestled on top of a staircase in the main square and has both indoor and alfresco tables (the latter is housed in a vertical garden). If you’re looking for top-notch seafood on your trip, this is it. Did you use this guide for things to do in Colombia on your trip? Tell us in the comments, and use #MyDomaineTravels in your travel photos on Instagram. Up next: The hidden fee to watch out for when booking flights.